Motherhood was seen as a woman's primary goal in life. Her job was to raise clean, well-fed and well-behaved children by adhering to strict routines and principles. Plunket provided mothers with firm, no-nonsense advice. 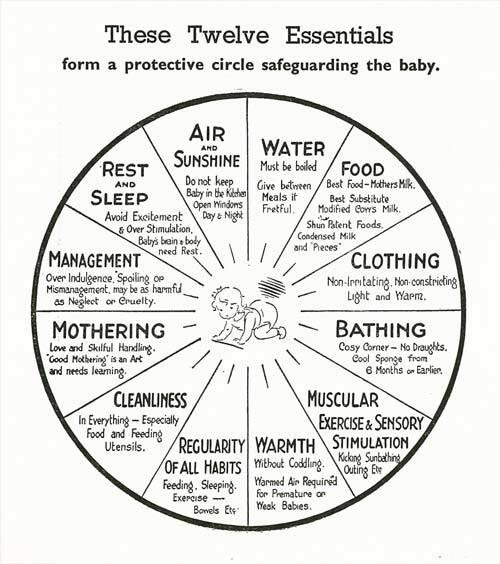 The 'twelve essentials' of baby management were published in Plunket books in the mid-20th century so mothers could have them on hand to refer to. The diagram emphasises warm, efficient mothering but warns women not to spoil their children – in the eyes of Plunket such treatment could be as harmful as neglect or cruelty.